A sales representative agreement establishes the relationship between a business and its work force. 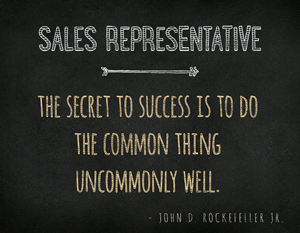 A business or company’s sales force represents the business to the public. As such, the people that represent the company and its products and or services need to be carefully elected, and an agreement needs to be carefully articulated to represent both parties’ interests. A written agreement of this nature ensures sales representatives are promoting a business’s products and or services to the right people. For Illinois small businesses that are just getting on their feet ,independent sale representatives are likely the best option because they are usually paid on commission and there is no upfront investment because the independent sales rep will be paid as the company gets paid. A sales representative agreement delineates the company’s rights and responsibilities. It also states the individuals and/or organizations that will represent, and act as advocate for, the business’s products and or services. It is essential that this type of agreement be reduced to writing because oral agreements tend to be vague, and without the ability to be able to refer to writing, confusion and misunderstanding will likely follow. The terms of a sales representative agreement will depend on whether the business has in-house or independent sales representatives. If the representatives are staff members then the business’s personnel policies will apply. On the other hand, if the agreement is between a company and an independent sales representative, the agreement will not impose its personnel policies and the independent sales representative is not subject to other implied-by-law duties. Because of this, an agreement with an independent sales representative needs to be comprehensive and needs to address all significant aspects of the parties’ working relationship. A sales representative agreement also needs to specify whether the representative’s job is to procure sales or customers (or both). A sales procurement agreement means that the representative will receive commission payments on those sales that he or she played an active role in achieving. A customer procurement arrangement, on the other hand, typically maintains that the representative will receive commissions on all sales, whether personally involved or not, because the representative’s job is finding willing buyers/customers. Other terms that ought to be included in a sales representative agreement are: the geographic territory the representative is assigned to sell within; a description of the products the representative will be selling; the representative’s post-sale duties and conditions on his or her right to receive commission based on the performance of those obligations (servicing and maintaining accounts); description of the commission rate the representative will be paid and specific description of how the commission is to be calculated; payment terms; standards of conduct; and terms of the termination of representation.